Discover Pharaoh’s Secrets and find his treasures with an absorbing 5 reel 20 payline Playtech slot machine. Observe the theme of ancient Egypt with its enigmatic pyramids, mysterious sarcophagi and dignified Pharaohs. Explore rich tombs and collect $100,000 jackpot. Win Free Spins and play Bonus Games with smashing cash prizes. Apart from lucrative bonus games Pharaoh’s Secrets includes Gamble feature for those who blindly trust their intuition and fortune. 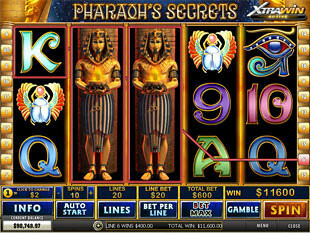 You can play Pharaoh’s Secrets in no download version in any Playtech instant casino. The slot includes the wild symbol that can substitute for all icons except the scatter. Pharaoh symbol is wild and it will help you form numerous winning combos and pocket more payouts. 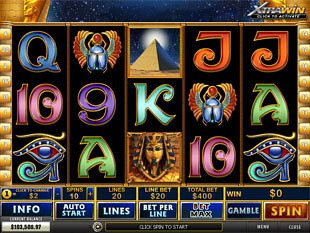 The main secret of the Pharaoh is that during the Free Spins feature it expands for the whole reel. It makes the whole reel completely wild so you can create winning combinations on many different paylines at the same time. During Free Spins the wild symbol will double your payouts. Pyramid is a scatter symbol that pays irrespective of paylines. You can scatter the Pyramid anywhere on the reels and it will award you stunning prizes. The maximum scatter payout is $40,000 for 5 Pyramids. All scatter prizes are multiplied by your total bet. This means the more you wager, the higher win you get. Only 3 scatters are enough to get you into the Secret Bonus Game. Starting the game you must choose a coin value ranged between $0.01 and $2.00. To increase total bet you can stake up to 10 coins per line. The maximum bet is for real high rollers – it is $400 per spin. Yes, it’s really huge but it also brings jaw-opening jackpots. With the maximum bet you can hit $100,000 top jackpot, $20,000 second jackpot and much more. Check the payout table to calculate the potential prizes. If you are not ready for high risks Pharaoh’s Secrets offers to play with one penny. You can enjoy real winnings and not worry about financial risks. Xtra Win Mode is an unusual innovation invented by Playtech. The slot offers you to activate Xtra Win Mode to get larger payouts. Click Xtra Win icon in the top right corner above the reels and increase all future winning. With Xtra Win Mode activated the maximum scatter payout will constitute $60,000 and the top jackpot – $150,000. This feature increases your current bet by 50%. Pharaoh’s Secret Bonus game starts the moment 3 or more Pyramids appear on the reels. The bonus game exposes 3 symbols. You need to choose one of them and reveal the random number of free spins. 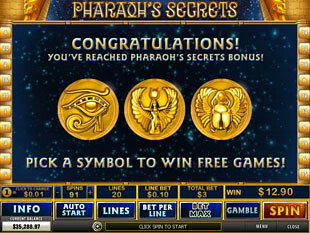 Pharaoh’s Secret Bonus game gives you a chance to win up to 100 Free Spins. Free Spins feature gets activated the moment you finish the Bonus game. It is an awesome chance to collect large payouts. The feature includes such benefits as the expanding wild multiplier that doubles every win. The feature can be retriggered anytime. Gamble Feature is a side game that can be played anytime you want. Click Gamble button and on the screen you will see 5 cards. The 1st card is open and the other 4 are face down. Your task is to open a card higher than the 1st one. If you guess right, you double or half double your win. If not – you will be returned to the main games. Gamble feature is a risky game, it can considerably increase your win or else you can lose your bet. Everything depends only on your intuition. 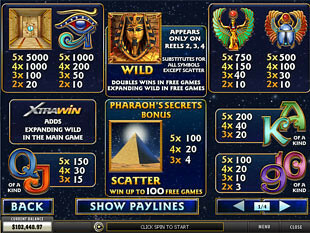 Pharaoh’s Secrets slot machine is a featured Playtech slot with crispy graphics and ancient Egypt theme. Play the game in any Playtech casino and benefit from high payouts and lucrative extra features.